Lebanon decides to put the northern city of Tripoli under the command of the military in a bid to end sectarian clashes. The move is part of a bid by the government to end repeated clashes linked to the war raging in Syria. 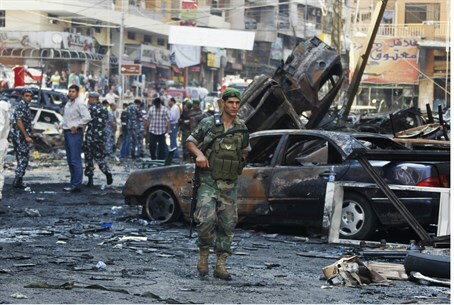 The measure, last employed during Lebanon’s 1975-1990 Civil War period, came as security forces deployed in the restive city where 12 people have been killed and more than 100 people wounded in three days of clashes between supporters and opponents of Syrian President Bashar Al-Assad. "We decided to commission the Lebanese Army to take all necessary measures to maintain security in Tripoli for six months and place the military forces as well as police under its command," caretaker Prime Minister Najib Mikati was quoted by The Daily Star as having told reporters after a high-level security meeting. A decree will soon be issued tasking the Army’s Military Council with determining the mechanism needed to implement the decision. The decree requires the signatures of Mikati, President Michel Sleiman and caretaker Defense Minister Fayez Ghosn, the report said. The decision infuriated Tripoli-based Dai al-Islam al-Shahal, the founder of the Salafist Movement in north Lebanon, who vowed to thwart the security measures. “Mikati is selling Tripoli out ... we can only see this decision as an attack on the Sunni community and its stronghold Tripoli,” Shahal told local media. “We will work on foiling this decision politically for the sake of Lebanon, its security and stability,” he added. Meanwhile, a 600-strong police force deployed to the northern city to end the intermittent fighting which picked up in the afternoon following a lull in the early hours of the day. Twelve people were killed and 100 wounded from the weekend clashes between the rival neighborhoods of Jabal Mohsen, which supports Assad, and nearby Bab al-Tabbaneh, a predominantly Sunni neighborhood which backs Syrian rebels. Among the casualties was a 12-year-old boy wounded by sniper fire and two soldiers. The sectarian clashes in Lebanon over the Syrian civil war have only increased since the Lebanon-based Hezbollah joined the fighting in Syria.